TorqueNews reporters Don Bain, Denis Flierl and Aaron Turpen were all there for press day at the 2012 Denver Auto Show to cover the nation's second-oldest automotive show where automakers reveal many of their plans for the Rocky Mountain region. The Denver Auto Show this year is one of the best so far, with highlights including the always-awesome Jeep Experience, awards given to automakers and journalists in the area by the Rocky Mountain Automotive Press, and reveals of autos and editions meant exclusively for the Mountain West. 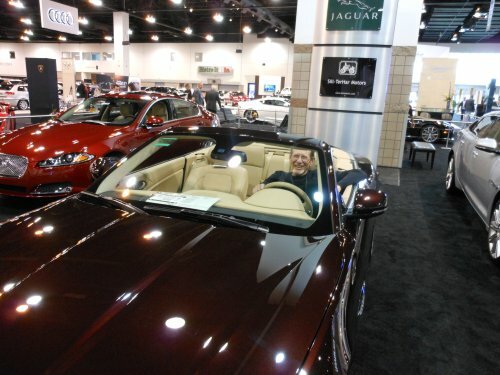 This year's RMAP winner for hitting all 12 points of the Green Drive was our very own Don Bain (pictured here lookin' for love in a new Jaguar). Press events by Ford, Chrysler, and General Motors showcased their latest releases including the 2013 Dodge Dart, the trend-setting Buick Encore, the beautiful 2013 Cadillac ATS, the Focus Electric and 2013 Escape, and future plans from Infiniti, including parent company Nissan receiving the RMAP award for Car of the Year. The Chrysler showcase included the much-anticipated 2012 Fiat 500 Abarth edition as well as the 2013 Dodge Dart, whose development is finalizing now. The Dart will be a newcomer to the compact market with strong economy features and great options at a $15,995 entry-level price point. Definitely a contender to pay attention to as it finalizes its Environmental Protection Agency testing and debuts on the market later this year. A 3-row luxury crossover, the JX is aimed specifically at families with a ton of useful features and options that parents will appreciate. Its emphasis on flexibility and ease of access make it a stand out in this competitive market. General Motors emphasized their new Buick Encore, a unique 5-seat crossover in the self-created luxury compact crossover market. This new entry emphasizes maneuverability, versatility, and has a lot of standard options that press home its luxury appeal on many levels. Cadillac showed off both their XTS and entry-level compact luxury ATS models, which are beautiful new renditions of the Caddy nameplate. Ford chose to emphasize their model line and future plans for EcoBoost and electrification at the show, prominently displaying the Focus Electric and touting plans for having the EcoBoost engine line in 90% of its models by next year. The example for this EcoBoost push was the Ford Escape, whose new 2013 model saw an additional 5 miles per gallon added with the technology. Future plans such as the new C-Max hybrid and plug-in hybrid and for a total of 6 electrified vehicles by the end of 2013 were explained.